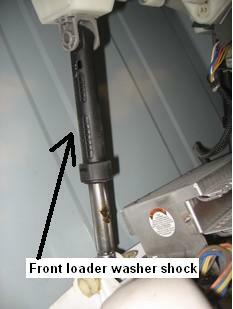 Front load washing Machine Vibration is the biggest problem with all front load washers. This page will help with solve this problem. This problem is even worse if it is on a pedestal. It is not that the pedestals are unstable; it is just that it puts the washer up higher, which gives it more of a wobble. It is like stacking blocks the higher they get the less stable they are. I am not saying you shouldn’t use the pedestals just that it may make it vibrate more. There are a few things that will cause this problem. First before you attempt to troubleshoot you may want to try these anti-vibration pads. The problem is so bad the company I work for will give these pads to people that purchase a front load washing machine with a pedestal. Some manufactures started recommending using these anti-vibration pads from the first day of use. If you tried the anti-vibration pad and they didn’t help there are a few other things that will cause this, so read the rest of this page. Typically you don’t have to level washers but with a front load washing machine, vibration is such a problem you need to make sure it is very close to level. But even more importantly, make sure all four feet are firmly on the floor. Front load washers are heavy, most likely heavier than your last washer. If your floor under the washer has any give it may be causing your vibration problems. If this is the case what you may be able to do is place a flat board under the washer. Of course the best thing is to repair the floor. Often floors get water damage by previous washers leaking. Sometimes the pulley on the back of the tub on front load washing machines will become loose. Typically when this happens the belt will come off or break but if it doesn’t it will cause the washer to vibrate significantly. To test this, remove the back and turn the pulley back and fourth vigorously. Watch out not to pinch your fingers, trust me it will. If there is any play in the pulley replace the pulley and the belt. The tub pulley can be purchased at AppliancePartsPros.com. All font load washers have shock absorbers and if they are bad it will vibrate badly. There isn’t a good way to tell if they are bad or not so if you go through the rest of this page and didn’t find anything else try the shock absorbers. Replacing them isn’t hard; remove the front panel and the rear panel. Once done you should see the shock absorbers, they are held on by large pins on the bottom and twist out at the top. Once the bottom is loose rotate the shock to release the top. Note I highly recommend replacing one at a time, otherwise the tub will have no support and it will make it harder to install the shocks, just keep up with which ones you have already replaced. These shocks can be purchased at AppliancePartsPros.com.